Hello again, today I will talk about searching. That is kind of my hobby now. I search and search. Sometimes I end up finding and sometimes I just have to let go. To be true, Google is my best friend when it comes to searching. No, I am not talking about things or Jewellery; I am not a shopping freak. I am talking about answers to my silly questions. Sounds crazy? Yes, I often when deeply dugged into a problem I search for answer. I don’t console myself or my deepest darkest agony to human. I do Google search. Google search is like talking to an angel for me. I put my question on the bar and then click on search sometimes it leads me to what I was searching and sometimes it takes me to link and links and I get lost in this neurotic web world and forget what I was asking about. Often, there are things that you cannot discuss with anyone or you don’t want to discuss. This is most amazing kind of a therapy I guess when you are depressed. Sometimes questions are Sacrilegious but the amazing part is that Google has response to that too, if you won’t get your answer you might get a lead which might help you search for your answer. Last night, I was kind of little depress , playing Panda Jam (game) on my phone to divert my mind but then I had my phone with the internet connection, I clicked on Google and wrote when will I be happy again. dim-witted question though but it lead me to some interesting articles , some true emotional stories and a link which said something like 7 reasons to be happy even when you do not want to be happy. 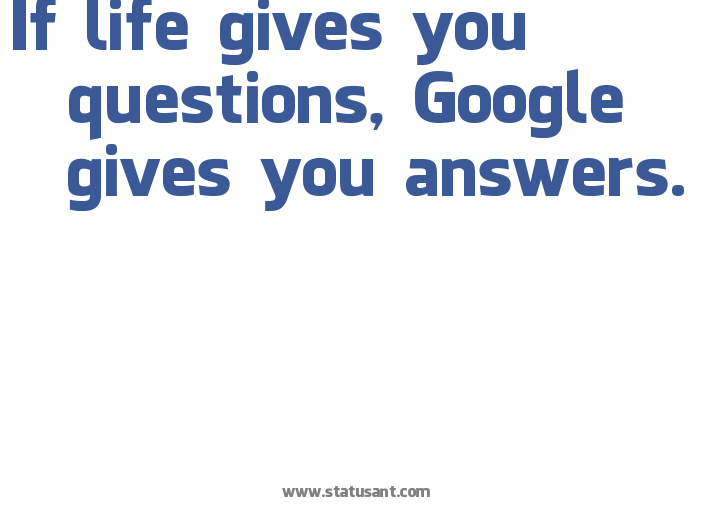 but google did not gives the feelings of answer like life gives.